We are now in the generation where shopping online for just about anything is just a click away. Not only does this include online shopping for home goods and at our favorite retail stores and restaurants, but it also includes deals on vacations and last minute getaways as well. I'm a huge fan of Groupon. I've been signed up for a few years now and I have to tell you, I've bought some amazing deals and have saved lots of money doing so. Just a couple weeks ago a few girlsfriends and I were in Chicago on a girls trip and got a great deal on a Chicago Crimes bus tour saving 50%, which was a fantastic deal. Groupon offers costumers a variety of unbeatable deals from places all over the world. You can discover the best a city has to offer on the web or on your smart devices for a fraction of the price. If you aren't signed up yet for Groupon, I suggest you do, it's free! Not only can you get great deals from Groupon, but you can save even more from your favorite retailers with Groupon Coupons. Groupon Coupons is a completely free way for shoppers to find thousands of coupons and exclusive promo codes from stores like JC Penney, Kohl's, Home Depot, Expedia, eBay and more. Not only are you getting free coupons, but you're also getting codes and samples all from your favorite brands. 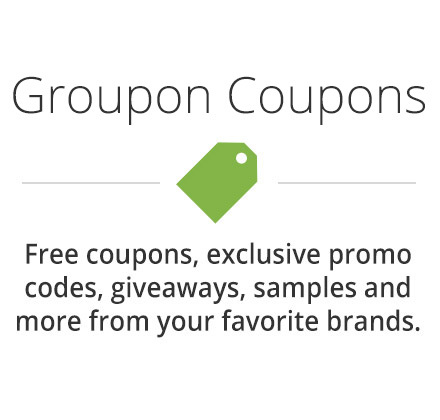 With over 8,000 brands, if there's a deal you're looking for, Groupon Coupons can help you out. You'll be saving lots of money in no time. I don't know about you, but this seems like a great deal. Did I mention this was free?! What are you waiting for, go sign up now and start saving dollars! Head to Groupon Coupons today to get free coupons, exclusive codes, samples, and more from your favorite brands! Disclosure: Although this post was sponsored by Groupon, all opinions are 100% my own.